1. Make the batter by first placing all of the dry ingredients into a bowl, and mixing them up with a whisk. Add 1 1/4 cups of the beer, then whisk. Add more beer to get a thick batter. If you prefer a thin batter like I used for the pictures, use up to 2 cups of the beer. 2. Slice the pickles into Wedges (quartered lengthwise), Chunks (1/2" - 5/8" thick), or Thin Slices. 3. Dry the cut pickles real well or the batter won't stick. For a thicker coating, you could coat the pickles with seasoned flour before placing in the batter. 4. I use a black frying pan for frying, I find it's easy to control the temperature, and I'm only cooking for one anyway. Place 1/2" of vegetable oil in the pan, heat it to 350 degrees, and place battered pickles in carefully being sure not to spatter the oil. Since you're using cold pickles, you've got to be careful that you don't place too many in the oil at one time, because it will make the temperature drop too much, and the batter will slide off. 5. As the pickles get browned, place them in a pan with a rack in it to drain. I don't use paper towels because they will make the pickles soggy. Serve while hot with or without your favorite dipping sauce. 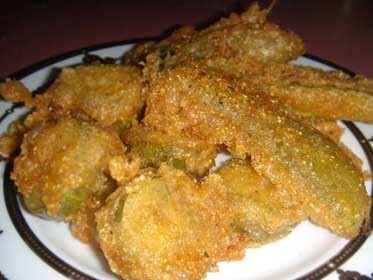 Frying something cold, like these pickles can cause a quick drop in the temperature of the oil. If the oil isn't hot enough, the batter won't stick to the pickles. You can fix this by using more oil, or by frying less pickles at a time. If you still have problems with the batter sticking, you can dredge th pickles in seasoned flour before dipping in the batter. The flour will dry the outside of the pickle, and help the batter stick.